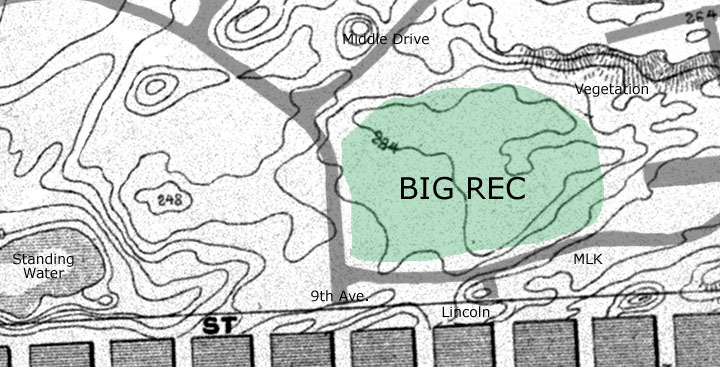 The recreational area bounded roughly by MLK, Middle Drive, 9th and 5th Avenues. Earliest records are from the survey of William Hammond Hall commissioned in 1870. Though a depression, it did not appear to have held standing water nor much vegetation. We can be assumed it to have been mostly shifting sand. In 1894 the space was leveled and served the almost daily parades of the Mid-Winter Fair. As reference, the "Tower of Light" set directly in the center of what is now the Music Concourse and the roadway in the foreground is Lincoln Way. Following the Fair, the aeas was returned to a pastural setting as seen in this image dating from about 1900.